thanks for sharing Jane, i have some friends coming over tomorrow, so i might give it a try! :-) it looks yummy! Thanks for sharing! May i ask if these puffs will come out hollow? If yes, do i just poke a hole and squeeze the pastry cream inside? Thanks so much! Hi Ems☆ Yes cream puffs certainly should come out hollow! As long as you follow the steps correctly. As for filling, at Beard Papa's that's exactly what they do, poke a hole and pipe the custard cream inside. I don't have piping tips, that's why I cut them and spoon it in. Thanks a lot,Shinobu.. i'll try it soon and will let you know what happens! Otherwise, the taste, texture and crispiness is just the way i liked it. The custard came out very delicious..it would have been almost perfect if not for #'s 1 to 3...LOL! I'll certainly be trying it again, but before that, may i ask you for some help again? 1. I only used 4 eggs because it was a bit runny already & the moment i spooned the batter onto the sheets, it went flat immediately. Maybe because it was still a bit warm (even if i used cold eggs as you've suggested). Is it possible to cool the cream puff pastry a bit before baking? 3. What is your technique in making the same-sized pastry? Hi Ems, To be honest even after making dozens of batches of cream puffs, choix pastry is still a mystery to me! Other choix pastry recipes actually have higher egg/water/butter to flour ratios, like (US Recipes) 4 eggs to 1 cup flour. I could only make small profiteroles with those recipes as the batter was quite thin, that's why I used 5 eggs to 1.5 (US) cups four, and reduced the butter and water also. 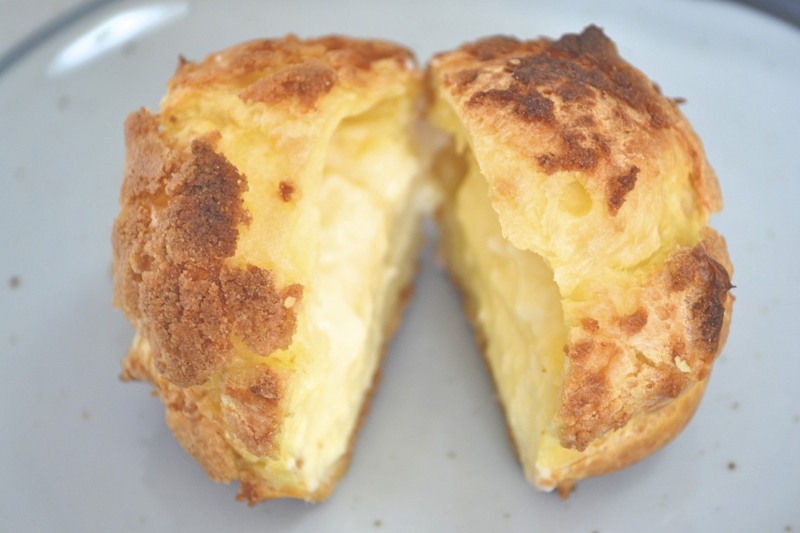 Using fewer eggs than this makes a thicker batter, however it also makes thicker cream puffs, not so light-as-air. So I'm not sure why already a few users of my recipe are needing to use only 4 eggs to 1.5 cups flour...as I said, mystery! 1. I allow the flour/butter/water hot dough to cool slightly before adding the eggs. Maybe allow it to cool longer at this stage. 2. When I make a batch of cream puffs, I always have one or two that get a hole in the bottom when I pull them off the paper. So I try to peel the paper off the cream puffs rather than the other way round, that works better. If the bottoms were overcooked I can only guess that your oven is different to mine, as I've never had that problem. Does your oven have an exposed heating element on the bottom? 3. The easiest way to get same sized cream puffs is piping them. Or maybe it's also because I've made them so many times! Practice makes perfect! Anyway, my recommendation to the beginner choix pastry chef is to first make basic cream puffs, and don't bother yet with the crispy shell topping, as it adds extra steps. I found your cream puff recipe on Google. I can't tell you how happy you've made me! I had these Japanese cream puffs at a local bakery and found them so much more addictingly delicious because of those crunchy stuff on the top. I can't wait to try your recipe. Thank you thank you thank you!! I am so glad i found your site. Been wondering abt how they make that crunchy thing at top and of course the dryness of the puff. However I found it hard to make the pai-shuu crust into a disc and ended up like an apple crumble instead. So tmrw i am going to up the butter content a bit and see how it goes. the puff puffed up nicely. and just to add a bit of tip...i saw this on another website...i actually sprayed water on my parchment paper....it helps from the sticking thing and adds water to the "steaming" and "puffing" process. Hi Norsie, I haven't tried spraying water on the paper, but good luck! Just wanted to tell I have been using this recipe for countless times after I found it last year! 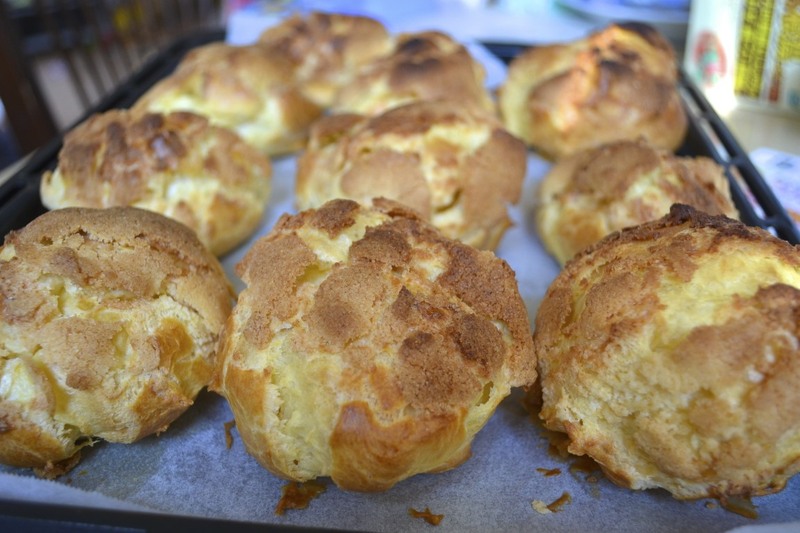 Puffs turn out to be delicious, every time! 2. Dont vopen the oven at all, the blast of cold air will deflate the puffs. I baked mine at 405f for 13min, turned down to 210f for 20 min without opening the door at all. As shinobu said don't turn down the temperature until puffs have fully inflated. 3. Don't put more then I layer/tray of puffs in at a time, the extra layer is extra moisture therefore extra steam and the pastries will not rise properly. 4. I baked mine on silpat (silicon baking mat) and it was great. The bottom did not stick, if you allow the pastries to cool a bit before removing them, they will come off easier. (4)Of course, leave them to cool before removing from the paper. I'll add that to the recipe! I use the cheap (non-silicon) baking paper in Australia, and it was fine as long as I peeled the paper off the puffs, not vice versa. Of course the silicon baking paper that I use in Japan is even easier (and I'm sure, the silpat, too!). I found your site yesterday and immediately made a batch of cream puffs since every ingredient was readily available from my pantry! Its my first time making cream puffs and it turned out great, i have a few questions though. My puffs rose but when i sliced them open they were less aerated than i had hoped, some were a little bread-like, what can i do to make them more airy, thin and crisp? :) Thank you! Hmm, getting steps 1, 2 and 3 right is really important. 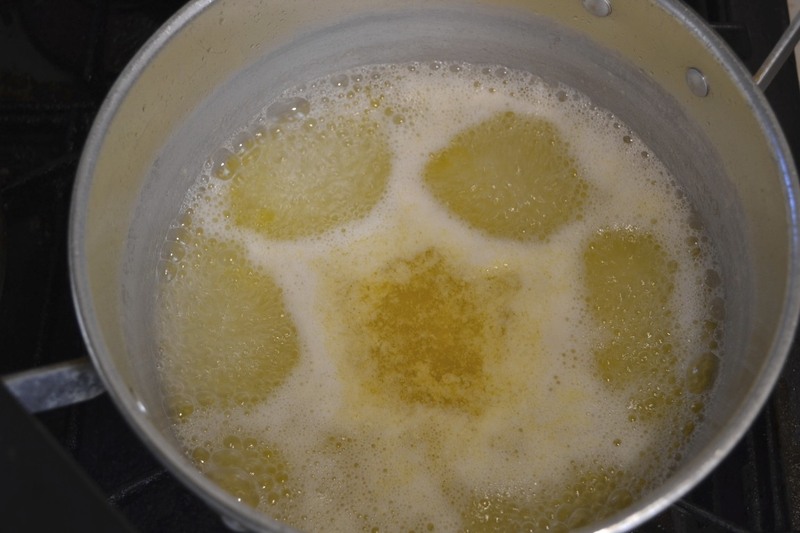 Was the water/butter at boiling point when you added the flour, and did you add the flour all at once and stir so it all cooks slightly and turns into a firm ball? Did you sift the flour first? Perhaps you could use more egg. 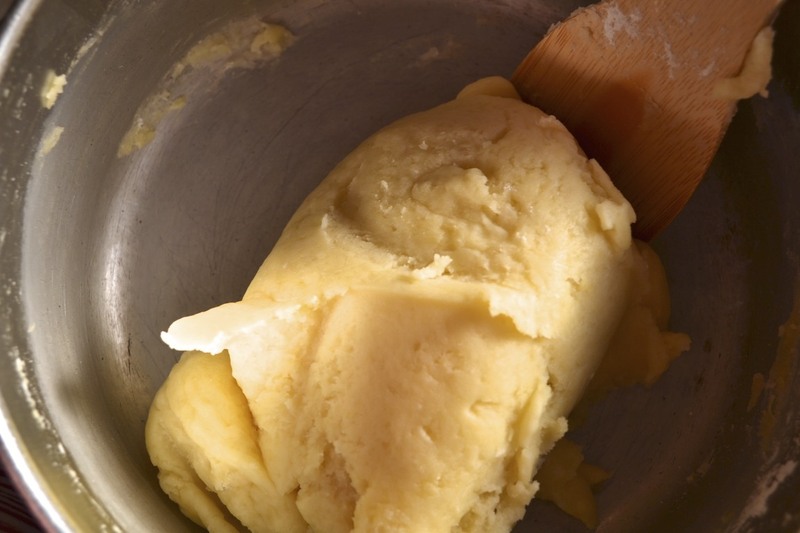 More eggs make lighter, thinner cream puffs, but make the batter thinner, so it's a tricky balance. Egg size and quality may be different in different areas, from what people have said. Also, make sure the oven is hot enough. When you put the trays in, make sure you do it very quickly so the temperature doesn't drop, or preheat to 10 degrees hotter, and turn it to the required temperature after placing the trays in the oven. And make sure they are well puffed and browned before you turn down the heat. Hihi. Just wanted to say that this is the most amazing puff pastry recipe EVER! I shalll swear upon this recipe to all my bake loving friends. However i have encountered a problem with my puffs. The base seems to have raised together with the puff, in other words it doesnt stick to the baking sheet but raises up together... Any advice to remedy this problem? As for "the base rising together with the puff", I'm not exactly sure what has happened, sorry, I don't think I've experienced that. Where your puffs not very hollow? If so, make sure you carefully follow steps 1-3 of the Cream Puff Shell Method. Good luck! Hi Peisee, make sure you leave your puffs to cool before removing them from the paper. Once they've cooled down, they'll become firm enough to remove without tearing. Peel the paper off the puffs, rather than the other way round. Other than that, using silicone-coated baking paper helps, if you don't have that, grease your baking paper with a little butter, oil or cooking spray. Good luck! This is awesome.........I will try but not today it needs some of my precious time...and the result will be worth it I guess. Hi I made a batch of cream puff today but I'm not using your recipe and I needed advice so I hope you can help me. 1)The surface of the puffs burned, the colour is brown not dark brown or light brown, just brown with burned taste. It's edible though. Hi, Sorry, but I don't know what happened there, or what kind of recipe you used! Have a look at step 6 in my recipe. Start with your oven very hot, but when they have puffed and are the right colour, turn the heat down to 100C or so, so they won't burn, and leave them there for a while so they can dry out some more. Hi, I made the recipe yesterday but I'm not sure where I had gone wrong. I think for some reason the filling went a little runny and it looks like there was some kind of cream puff murder in my kitchen when I tried to do the filling using the piping bag. I don't think it was solid enough to be piped correctly. I kind of lost half of the filling dripping on my kitchen counter! The flavor was great, though. Any advice on how I should maneuver it if I were to use a piping bag? Hi Tari!☆ Sorry, I don't know what went wrong either! 1/2 cup flour and 4 egg yolks should make quite a thick custard of 3 cups whole milk... unless, the flour didn't dissolve properly and there are lumps in it? To pipe the filling in, first you need to poke a little hole in the side of the puff, then insert the tip of the piping bag into it. Good luck next time! Yep, did that, followed your recipe to the t! It is quite a thick custard and tasted very nice (I added 1 Tbsp of rum in it, gave it a nice depth), and folded some whipped cream into it, but it was still a little bit too runny, I think. Maybe next time I will follow what you do and just spoon it into the choux pastry shell. Anyways, thank you so much for the recipe! Question: what happened after step 2? Should I roll it out and make discs out of it before letting it sit? Hmm, that happened to me once before. I think it was because the melted butter was hot.(?) I guess make sure the butter is just warm or even cooled down before the sugar and flour go in. After step 2, I just leave it as it is until I'm done piping out the choux (Cream puff) pastry on the trays. Then I just scoop a teaspoon at a time, flatten it in my fingers and place it on top of one, and keep going. But really, you could roll it out too - however you like! Thank you, Shinobu.I will try it again next time. You're right the butter was hot. I will make sure the butter is not so hot next time and let you know how it goes! I'm so happy that I found this receipe! I love Beard papa's cream puff! I have a question, I made the custard filling but it turned out to be too solid like a dough. It wasn't smooth and runny like yours. Did I leave on the stove for too long? Is that plain flour or corn flour that I need to use? I used plain flour but have seen many receipes call for corn flour. Oh! and also, is the pai-shuu crust the same as that on top of melon breads? Yes, you can halve it! The pai-shuu crust is similar to melon bread top, although I've never made melon bread so I don't know for sure! Hi,Shinobu l have been trying to make cream puffs many time but always turn flat and soggy after baking but after trying your advice on the time it came out well and hollow in the middle,thanks so much. i just made these and the cream puffs were FANTASTIC! The choux balls were beautifully upright, custard was delicious (even without the whipped cream), and it tasted great without the crust. 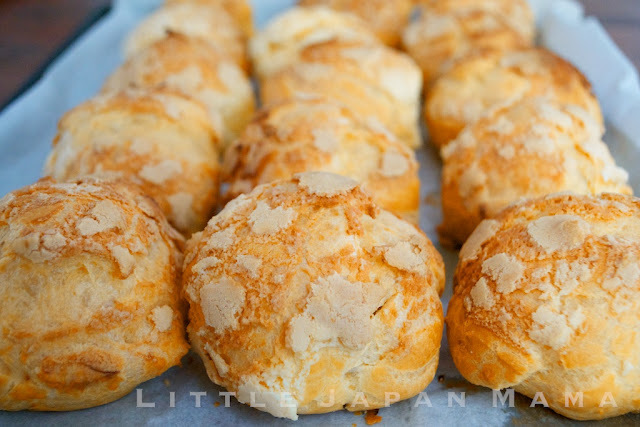 This is now my go-to cream puffs recipe. Tastes very similar to Beard Papas. Thanks so much!! I'm thrilled. 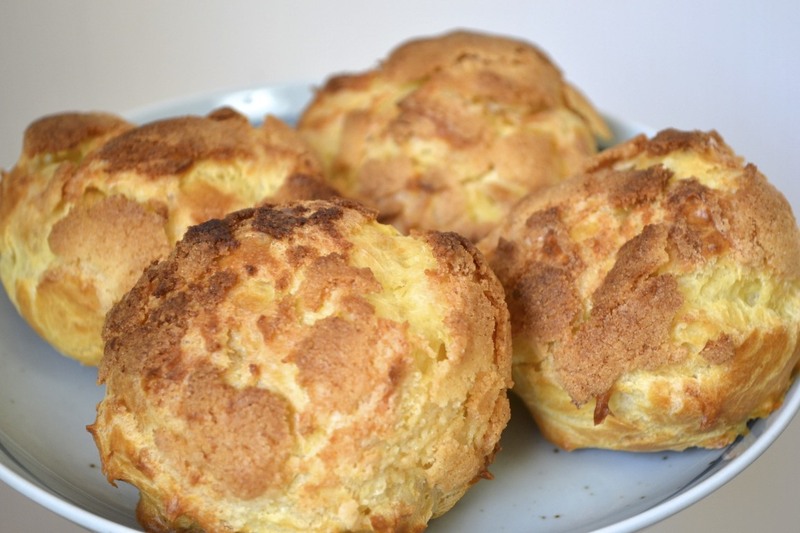 The best recipe for cream puffs ever! Hands down! Just treid them today and I was in awe of how beautifully choux pastry rose, supre light and cripsy texture on the outside! My pai shuu came out very crumbly.. they were falling apart and I wasnt able to roll them out on one piece, so i drizzeld these crumbs on top of the chouz pastry.. NOt sure what went wrong there however once baked they did the job! Created a cripsy outer layer.. just wished I had more of it ! Please share with me what you think might went wrong .. I assure you I followed your directions.. maybe I stirred the butter to long over high heat..? Other than that. this recipe is a winner! TRY IT AND YOU WILL BE SURPRISED! May b I need to improve on the choux pastry.. cos the hollow inside is not so deep..
Have been craving for beard papa's for days!! and found your recipe, tried it, AND LOVED IT SO MUCH. Made one batch of it and its gone in half an hour. Couldnt wait for the custard to cool off hehe i bet if i wait a bit longer it would be yummier. Certainly going to bake this again tomorrow :) Thanks! The batter was very nice. I don't know about the crust but mine didn't come our right the first time. The second time around, I just used a regular cookie dough and it came out great. Instead of the cream filling, I stuffed it with ice cream and the kids loved it. Great! Cream Puffs stuffed with Ice-cream are called "Shu-ice" in Japanese! may i know, how long can i keep this creampuff after i've filled in the filling? Ifvi put in the fridge, will it lose the crispiness?? Yes, if you put them in the fridge they will loose their crispiness. They only stay crisp for several hours, as the inside is still a bit moist after they are baked. By the next day, they will have lost some crispiness, but will still be yummy. 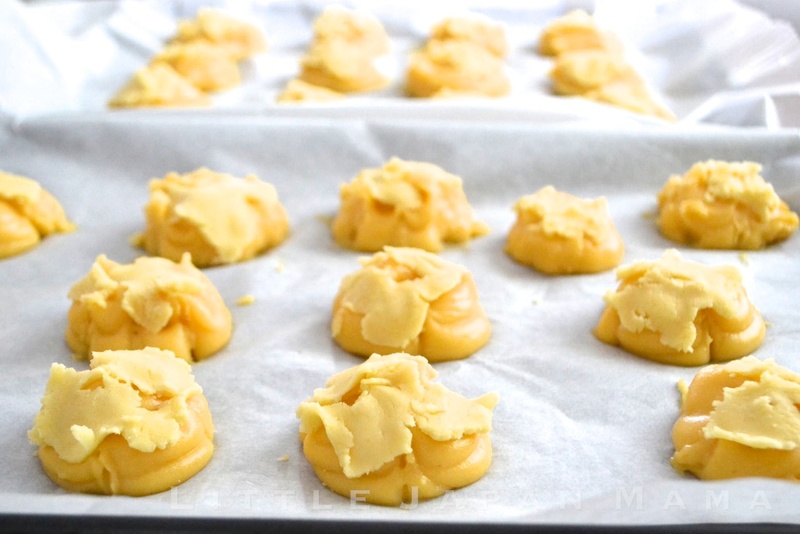 U did mention that we need to put the choux pastry immediately into the oven after piping it to the tray..
so, how would u suggest if we want to do several batches of the pastry. Do we have to wait for the pastry to almost cooked, then we pipe it to the next tray (so that we can immediately put it into the oven), OR we can just pipe it to the 2nd tray and wait (for about 1 hour) for the 1st batch to cook? I've always cooked two trays at once in a fan-forced oven, and never had any trouble. However, if you need to cook them in separate batches, I think it is best to wait until the first batch is nearly cooked before piping out the second batch. Otherwise, the piped blobs may loose some height while they are waiting. Good luck! Hi, ive been wanting to do this. but i have a question to ask. Thanks for sharing this ...may I know 1 cup of water / flour / sugar = ? gram (in your recipe)? 1 cup is 250ml so that's 250g of water, but it will be different for flour and sugar. Maybe a conversion website can tell you. Sorry! Hi thank you for sharing your recipe. I adjusted the temp to 200 for 24 mins n switch to 180 for 20 mins n also see only 4 eggs. Hello. Thanks for sharing your recipe... It went nice though when I first tried it but the pastry keeps becoming hollow at the bottom. So my pastry shell has a big hole beneath. Do you have any idea how to prevent this? What could be the reason that my pastries turned out this way? How to prevent paishuu part for over cook. The cream puff form well but the paishuu part is too dark. Any tips? Thanks for this wonderful recipe. It is the perfect recipe for me. Love the way the puff turns out crunchy n crispy. 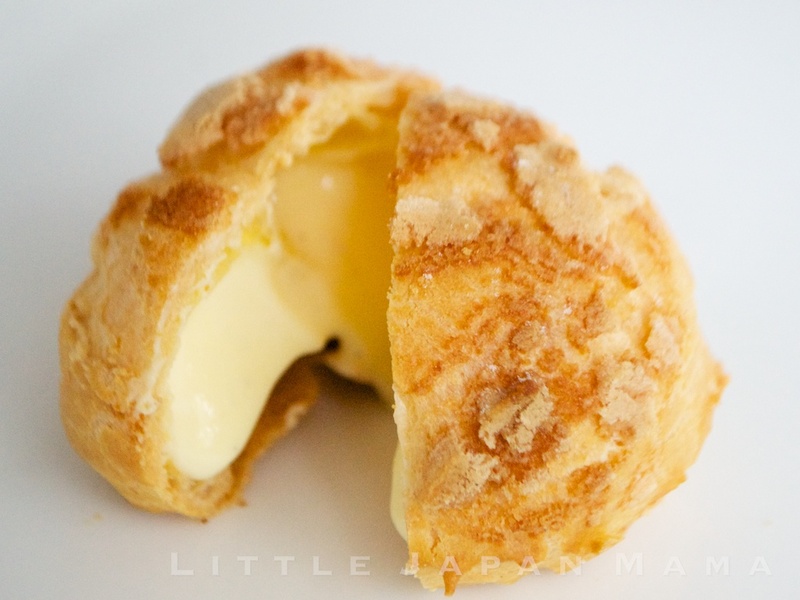 Really very similar to beard papa puffs. These turned out fantastic! 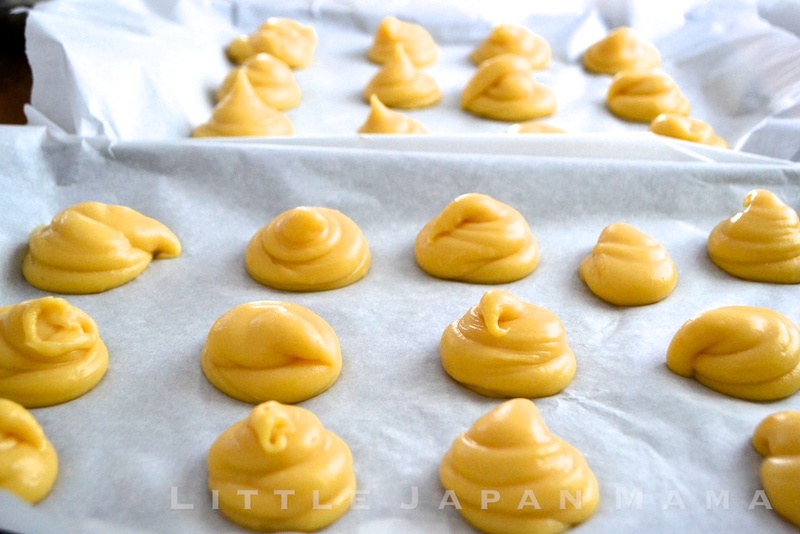 It was my first time baking cream puffs but if you follow the instructions then they are super kantan (easy)! They inflated amazingly and were absolutely glossy and beautiful! The insides were perfectly hollow, the outside was crisp and golden brown, and they looked like they were from a patisserie! 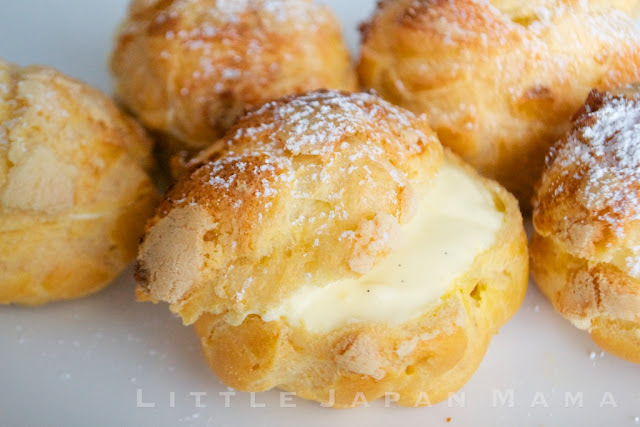 Everyone said they tasted just like Beard Papa cream puffs! Thanks for the great recipe! I try this recipe last weekend. Actually, when it fresh from the oven it really crispy, and yeah this what I want! I really like it, perfect! But.. after I spread the custard, in an hour, it's not crispy anymore T_T, did I made mistake? how can I hold the crispiness longer? ah, so it from the custard, right? thank you! Hi, what is Pair Cream that you've mentioned? 1. The Pai-Shuu crust - What happens after step number 2? Please explain in more detail. Also, is it possible to leave out the crust and just make the Shuu and the cream and still get the same result? How important is the crust? And do you have to allow for any cooling time when making the crust? 2. - When piping the shuu mixture on to the tray, how big should you pipe them? Would it be like the size of piping a cupcake or would it be smaller? Your piped cream on the tray looks quite small. 3. Approximately how many cream puffs can you get from this recipe? Sorry for all the questions. I have never made this before and want it to come out perfect. I have tried to bake 2 trays at once in a fan forced oven but the top tray of puff did not raised. The bottom tray raised beautifully. Any idea why? This quick tutorial on Rotate Layer Photoshop Cs6 brushes to any angle you need will ... on a separate layer, then rotated or flipped it to where I wanted it to end up. Thanks for how to cooking. Thanks to sharing good recipes, of course I like to eat. I want to do this recipe. The Patriots' quarterback signed a contract extension in March that included a $28 million signing bonus, lowering his 2016 base salary from tom brady wiki $9 million to just $1 million in the process. That could save Brady close to $2 million in game checks if his four-game suspension stemming from the "Deflategate" saga is upheld. Minél több jelenetfotó és trailer jön ki Natalie Portman nyomasztóan furcsa sci-fijéhez, az Annihilationhöz, Annihilation watch online 2018 annál inkább sajnálom, hogy itthon nem fogják játszani a mozik. A napokban például több izgalmas werkvideó is kikerült a netre, amiben a csupa női főszereplőből álló stáb beszél a saját karakteréről.